INTERNATIONAL JOURNAL OF CURRENT RESEARCH IN BIOSCIENCES AND PLANT BIOLOGY (Print ISSN: 2349-8072, Online ISSN: 2349-8080) is an international journal of Excellent Publishers (India) devoted to the field of Biosciences and Plant Biology. The journal is intended to publish high-quality articles, in English, in all areas of Biosciences and Botany. The thrust research areas include anatomy, biodiversity, biochemistry, bioinformatics, biotechnology, microbiology, pharmacology, taxonomy, embryology, ecology, ethnobotany, medicinal and aromatic plants, palaeobotany, physiology, plant tissue culture, phytochemistry, plant-microbe interaction, waste management and any other related areas in the subject are suitable for publication. The articles submitted will be reviewed by two to three peer reviewers before acceptance. The length of paper should be 10-15 pages. The paper should be original in nature; research findings and works related to the research to be given in detail to verify the work by others. The Short Communication is suitable for new models, innovative methods and techniques. It is similar to original research papers, but with limited data. It should be sent a maximum of 2 to 4 pages in length with two tables and one figure. Review can be made by authors in the current topics and intensive areas. It must be within 18 pages length with no more than 60 references (Reviews) / 30 references (Mini-reviews). Reviews are also peer-reviewed. Novel/interesting/extremely rare cases or rare presentations can be reported. Cases with clinical significance or implications will be given priority. It should be 3 - 4 pages in length. It should reflect short, decisive observations and should be up to 1000 words and with a maximum of five references. Authors interested in submitting a paper are requested to send their manuscript for review to the Editor-in-Chief. The submission of a paper implies the author's assurance that the paper has not been published and that it has not been submitted simultaneously for publication elsewhere. Once a paper is accepted, authors are required to transfer the copyrights of the paper over to the publisher and should submit the copyright form. All manuscripts should be submitted through online or by email to the Editor-in-chief directly at editorinchiefijcrbp@gmail.com [or] submit@ijcrbp.com. The submission should include the email and regular address of the corresponding author and all co-authors. Electronic submissions should be sent to the Editor-in-Chief as MS-Word file. The authors may send two or three reviewers for the manuscript (IJCRBP may designate other reviewers). 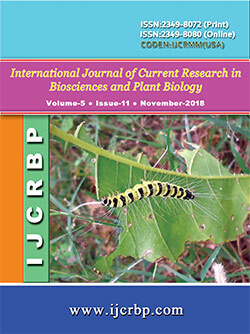 Note: The International Journal of Current Research in Biosciences and Plant Biology accepts Manuscripts only through e-mail. All papers must be written in clear, concise and should follow the format. The original typescript should be submitted electronically in 8.5 inch × 11 inch format, with a word count of 5000-7000 (excluding figures), The text of the paper should include Title and author/s, Abstract, Keywords, Introduction, Materials and methods, Results, Discussion/Results and discussion, Conclusion, Acknowledgments (if any), references and notes, tables, figure captions and figures. All papers must be written in UK English. If English is not your first language, please ask an English-speaking colleague to proofread your paper. The title should describe the contents fully and shall be as short as possible without the use of abbreviations. Please include full name(s) (do not use initials), position, department, name of institution, full postal address and email address for each author. The author to whom the correspondence is to be sent should be indicated. An abstract of no more than 200 words describing the content and results of the paper should precede the text of the paper. No more than 6 keywords for your manuscript, in alphabetical order. Introduction must be clear and concise. Author(s) should state the reasons for carrying out the research work, background of the study and the hypothesis. The introduction should be understandable to the researchers from various science disciplines and should include up to date references. Materials and methods must include study design, methods adopted/used along with references and statistical information. It must be enough to allow experiments to be reproduced. Any previously published research work can also be cited and notification should be mentioned clearly. Subheadings should be used. Results of research articles or manuscripts should be present with clarity. Previous publisher’s findings should be written in present tense. Results should be explained highlighting the significant observations. Statistical significance must be indicated. Discussion, interpretation should be included in the results but should be put into the discussion section. Figures and graphs should be black and white, or in colour, embedded in word file, and numbered sequentially; they must be placed at the end of the article, rather than interspersed in text. Prepare all figures, especially line diagrams, to the highest possible standards. Tables are to be numbered with Arabic numerals in the order of their citation in the text and included in the main document at the end of the text following the references section. Tables should be submitted as MS-word, not as PDF or embedded image or any other forms. Discussion part of the research paper includes the significance of the results related to study, comparative analysis with similar or related works along with proper citation. Avoid stating too many citations and ensure to include recent references. Results and discussion may be combined and given as a single section. This section should be thanks to people, granting body, university departments, and college departments, and should be in a brief manner. References should be used to cite relevant published work. In the text refer to the author's name (without initial) and year of publication. If reference is made in the text to a publication written by more than two authors the name of the first author should be used followed by "et al.". Use the Harvard (name and date) short reference system for citations in the text with a detailed alphabetical list at the end of the paper. For example “As observed by Darwin (1881)…” or “Parthasarathy (2010) suggests...” or “Prakash and Karmegam (2010) found that ...” or “A study (Gupta and Garg, 2009) has shown that ...” or “Kale et al. (1982) reported that…” or “… has been reported (Karuppusamy et al., 2002; Jain, 2004; Vishnubalaji et al., 2012; Cowan, 2014).” or “The observations of the current study is falling in line with the study conducted by Reinecke and Reinecke (2004)”. Citing two or more publications by the same author(s) in the same year in an article is to be given as: “Alagesaboopathi (2014a, b) investigated the utilization of medicinal plants…”; Footnotes should be avoided. References should be made only to works that are published, accepted for publication (not merely 'submitted'), or available through libraries or institutions. Any other source should be qualified by a note regarding availability. Full reference should include all authors' names and initials, date of publication, title of paper, title of publication, volume and issue number (of a journal), publisher and form (books, conference proceedings), page numbers. All references cited in the text should be listed following the text of the manuscript. The manuscript should be carefully checked to ensure that the spelling of author's names and dates are exactly the same in the text as in the reference list. Alagesaboopathi, C., 2014a. Herbal treats practiced by tribal and rural populace in Arunoothmalai hills of Salem District, Tamilnadu, India. Int. J. Curr. Res. Biosci. Plant Biol. 1(1), 15-25. Alagesaboopathi, C., 2014b. Medicinal plants used by tribal and non-tribal people of Dharmapuri District, Tamilnadu, India. Int. J. Curr. Res. Biosci. Plant Biol. 1(2), in press. Kale, R.D., Bano, K., Krishnamoorthy, R.V., 1982. Potential of Perionyx excavatus for utilizing organic wastes. Pedobiol. 23, 419-425. Karuppusamy, S., Rajasekaran, K.M., Karmegam, N., 2002. Evaluation of phytomedicines from street herbal vendors in Tamil Nadu, South India. Indian J. Trad. Knowl. 1(1), 26-39. Parthasarathy, N., 2010. Indigenous knowledge of the medicinal plant resources of Coromandel Coast forests of Peninsular India in modern period. Ind. J. Hist. Sci. 45 (3), 441-445. Prakash, M., Karmegam, N., 2010. Vermistabilization of pressmud using Perionyx ceylanensis Mich. Bioresour. Technol. 101 (21), 8464–8468. Vishnubalaji, R., Al-Nbaheena, M., Kadalmani, B., Aldahmash, A., Ramesh, T., 2012. Comparative investigation of bone marrow and adipose derived mesenchymal stem cells differentiation capability by qualitative and quantitative analysis. Cell Tiss. Res. 347(2), 419-427. Cowan, M.M., 2014. Microbiology: A Systems Approach. 4th Edn. McGraw-Hill. p.896. Darwin, C. R., 1881. The Formation of Vegetable Mould through the Action of Worms with Some Observations on Their Habits. John Murray, London. Jain, S.K., 2004. Manual of Ethnobotany. Scientific Publishers, Jodhpur, India. p.193. Reinecke, A.J., Reinecke, S.A., 2004. Earthworms as test organisms in ecotoxicological assessment of toxicant impacts on ecosystems. In: Earthworm Ecology (Ed. : Edwards, C.A.). CRC Press, New York. pp. 299-320. Abbreviate the titles of periodicals mentioned in the list of references according to the International List of Periodical Title Word Abbreviations. Electronic proofs will be sent (e-mail attachment) to the corresponding author as a PDF file. Page proofs are considered to be the final version of the manuscript. With the exception of typographical or minor clerical errors, no changes will be made in the manuscript at the proof stage. Because the IJCRBP will be published freely online to attract a wide audience, authors will have free electronic access to the full text (in PDF) of the article. Authors can freely download the PDF file from which they can print unlimited copies of their articles. Authors are required to pay processing charges (For Indian Authors: Rs.2000; For Foreign Authors: 100US$). Publication of an article in the International Journal of Current Research in Biosciences and Plant Biology is not contingent upon the author's ability to pay the charges. Neither is acceptance to pay the processing fee a guarantee that the paper will be accepted for publication. Authors may still request (in advance) that the Editorial Office waive some of the processing fee under special circumstances.